Leverage Is One of the better series on television. The concept and storylines of the Season Four television series Leverage are good and the talent nicely cast. Now on DVD all the advantages of being able to see the shows in their entirety unencumbered by commercial breaks makes the entertainment even better. If you like crime shows that intrigue infused with some comedy, then Leverage's 18 episodes should make your evenings a bit more fun and suspenseful. With a smart team of con artists Nate Ford (Timothy Hutton) fights crime in a very unorthodox way that in most cases involves catching the perpetrator while profiting from the bad guy himself. His fellow crime fighters, Parker (Beth Riesgraf) a cat-burglar whose gymnast abilities get her into tight spots, Alec Hardison (Aldis Hodge) an amazing computer hacker and communications expert, Eliot Spencer (Christian Kane) nicknamed "The Hitter" due to his highly skilled martial arts ability, and Sophie Devereaux (Gina Bellman) a highly gifted con artist who can change her personality and voice to fit any situation make solving crime a creative art. Each episode takes a lot of twists and turns on their way to a thrilling ending. It's the fun of the small guy getting back at Mr. Big that makes it a catchy show. The tongue in cheek comedy and chemistry between the characters make the show an eventful evening. What's really exceptional about Leverage is that you do not have to go back and watch former seasons to get the motivation and personalities of the characters to enjoy the show. The show gets a little far fetched at times, but isn't that with most crime drama's these days. Leverage does what it's supposed to do, entertain while depicting the good guy getting back at those who would get away with, yes, even murder. Of the four seasons, this season has the most episodes. Whether it's recovering lost evidence or getting a heart to it's rightful recipient, the team has 18 reasons to sit back and enjoy. The DVD has several special features that are actually very good. 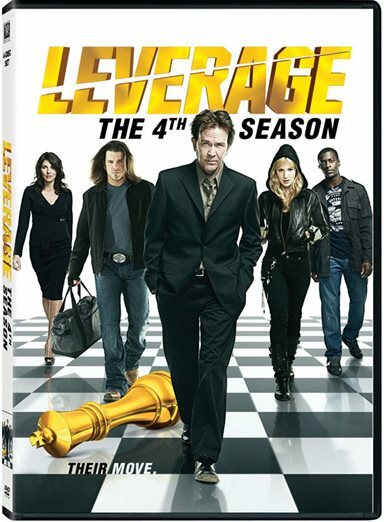 Download Leverage Season Four from the iTunes Store in Digial HD. For more information about Leverage visit the FlickDirect Movie Database.